Pruning the trees and shrubs in your garden or yard has manifold advantages. As well as stopping them from hogging all the space in the garden, regularly pruning trees and shrubs stimulates growth, puts an end to the spread of diseases, and is arguably a good way to unplug and reconnect with nature. Compared traditional loppers, the modern loppers come with a plethora of features that make them a joy to use. The simplicity of their design, ease of use, efficiency, and speed can be the difference between clearing swaths of land in a snap and spending the whole day on the activity. The 21st century and the accompanying technological advancements heralds the proliferation of loppers of various sizes and types on the market. As such, it’s understandable for the homeowner to feel overwhelmed by the different choices available, especially considering their focus on getting the greatest bang for their bucks. We’ve dutifully simplified the process by discussing, in the next few paragraphs, the consideration to keep in mind while shopping online. Thereafter, we’ve put a carefully curated list of 10 of the best loppers on the market currently. Read on. 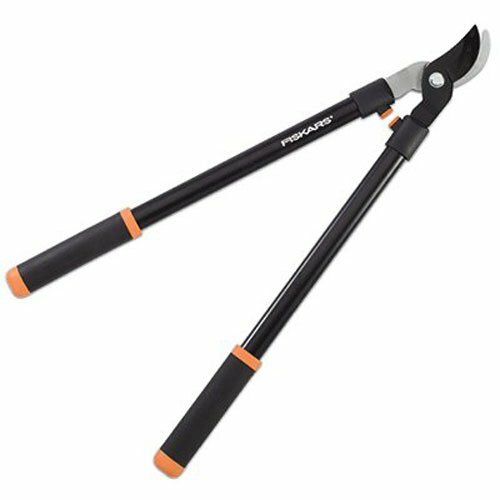 Coming from an established industry doyen, this Fiskars option has all the features to make for quick, easy, and accurate cutting of the thickest and toughest branches around your property. In addition to being a high-performance choice that powers effortlessly through the peskiest branches, the lopper is also easy to use. Cutting through the thickest branches and twigs with traditional options can be a daunting and time-consuming endeavor. However, the Fiskars 32 Inch PowerGear2 comes with a patented gear technology that conveniently multiplies leverage and a little effort on the handles to enable you quickly and effortless cut various branches, twigs, and brush up to 2 inches in thickness. Compared to traditional models, it cuts up to 3 times faster especially when the aforementioned technology is coupled with the cam mechanism that works by focusing power on the thickest parts of the branch. A second feature that stands out is the ingenious design of the blade. The construction of the bypass-style blades from first-rate, fully hardened steel and their treatment with rust-resistant, low-friction finish means they can withstand loads of wear and tear. Another benefit is the implied lasting durability. The blades also feature enhanced geometry that improved balance and therefore makes for quick and easy cutting of branches in awkward or hard-to-reach spots. Versatility is achieved through the incorporation of long handles. For comfort and superior control, the product comes with oval-shaped grips on the handles in addition to the conveniently placed Softgrip touchpoints for preventing hand fatigue, strain, and blisters. Plus, at 4 pounds with dimensions of 10.8 by 1.2 by 33.5 inches, it is both lightweight and compact therefore an ideal choice for overhead cutting tasks. Thanks to the time- an energy-saving Power Source cutting action, the Corona SL4364 easily and quickly cuts branches, limbs, and twigs up to1-3/4 inches in thickness, closely rivaling the cutting capacity of our number 1 pick. The technology eliminates the need for opening the handles too wide to cut efficiently, as is often the case with cheap, off-brand options. Compared to no-frills options on the market that might tempt you to use a ladder, this product features extendable handles that conveniently extend between 27-1/2 inches and 37-1/2 inches, giving you quick, hassle-free reach to far-flung branches and limbs. The icing on the cake though is the incorporation of the innovative two-zone blade design that’s versatile for accommodating both large and small branches. The technology further lays the foundation for more accurate and uniform cuts, allowing you to complete your cutting applications in a fraction of the time it would take traditional, humdrum loppers. For this option, cutting branches, twigs, and limbs up to 1-3/4 inches in diameter is figuratively like cutting through a piece of cake with a hot knife – effortlessly. Durability is also one of its strong points. The brand, like most of its competitors, resorts to using the single piece of material construction for both the handles and blades, resulting to a formidable connection between the two to prevent snapping or twisting with excessive cutting force. For ease of use, it comes with a ShockGuard bumper for reducing fatigue while the ComfortGel and ergonomically designed handles enhance comfort and controllability. For gardeners, the Corona SL4364 is a must-have. The long-lasting construction, easy-to-extend handles, lightweight and slim profile, and cost-effectiveness of the product all work in its favor. Don’t let the classic, attractive appearance of the Tabor Tools GG12 fool you because, beneath the surface, the product boasts volcanic performance and easily holds a candle to expensive, premium loppers from more established brands. 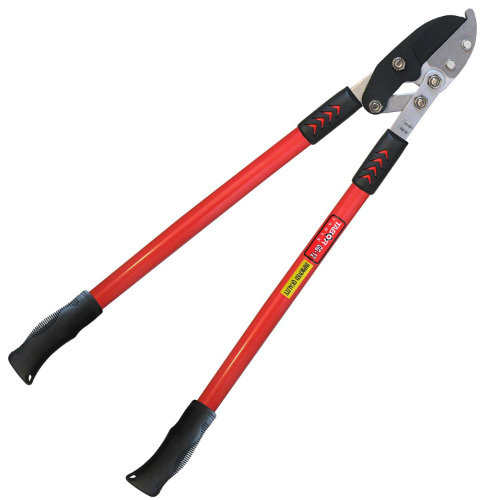 Expectedly, it cuts like nobody business and makes quick and work of the thickest branches and dry limbs, helping you to restore the beauty of your yard or garden in a snap. So sharp are the blade and so comfortable are the handles that if you find yourself begging your neighbours to let you cut their overgrown and overhanging branches and limbs for them – free of charge - you’ll know why. For homeowners who’ve been desperately searching for the perfect option for preparatory cuts and cut-to-length work, your search ends with the Tabor Tools GG12. It allows you to quickly and effortlessly cut branches and limbs and twigs up to 2-inches in thickness without breaking a sweat. The fact that it comes with extra leverage and compound action power only adds to the cutting prowess of the sharp, hardened carbon-steel blades. Steel helps with long-lasting edge retention and provides the resilience and strength to withstand not only the test of time but also extreme, everyday use. Unlike standard options that will quickly get stuck and jam on the slightest encounter with sap, the lopper will invariably provide you with clean, crisp and accurate cuts, thanks to the low-friction, non-stick coating of the blades. It’ll simply glide through sticky branches, twigs, and limbs, enabling you to clear swaths of land quickly. To ensure your grip is both comfortable and firm, the GG12 comes with soft, rubberized grips on the handle. And for optimal and effortless cutting, you lopper provides extra strength and leverage through its 30-inch handles, means you won’t have to apply as much effort as you would with cheap, off-brand models on the market. In all, it is a high-performance, dependable, easy-to-use, and cost-effective option and will quickly prove to be a valuable addition to the toolbox. If the mention of Spear & Jackson brand doesn’t ring a bell, well, sit tight because that’s about to change. The name may not resonate with you as clearly as DeWalt or Fiskars does but their flagship lopper, the Spear & Jackson 8290RS, comes with an endless raft of nifty features that set it apart from other options on the market. 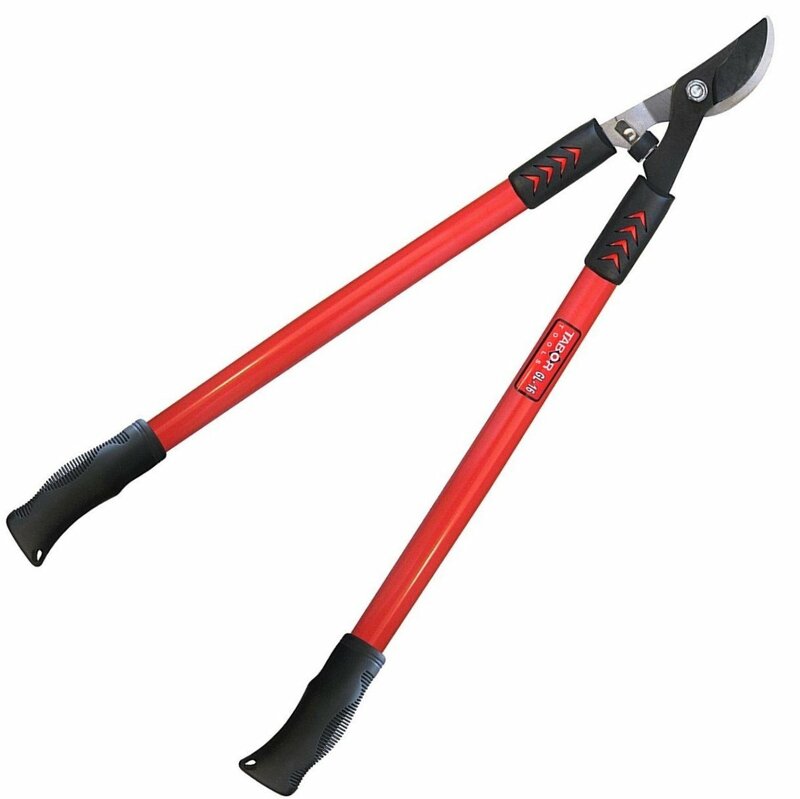 Among other things, the Spear & Jackson 8290RS sports a ratchet action that makes it remarkably easy for the user to cut down tough and thick overgrowths in the yard or garden including branches, limbs, twigs, and leaves up to 3 inches in thickness. The blades cut gracefully, smoothly and cleanly, and are remarkable long-lasting owing to their all-C50 carbon steel construction. To these instrumental features add the easy-to-use telescopic handles and the lightweight and compact design. Cheap, off-brand options can easily snap or twist when cutting down thick and hard branches. Also, considering their likely run-of-the-mill construction, you’ll have to squeeze hard on the handles, all the while gnashing your teeth while cursing. The ingenious and intuitive design of the Spear & Jackson 8290RS circumvents these challenges by sporting a time- and effort-saving ratchet action system for taking the hard work from any cutting activity. 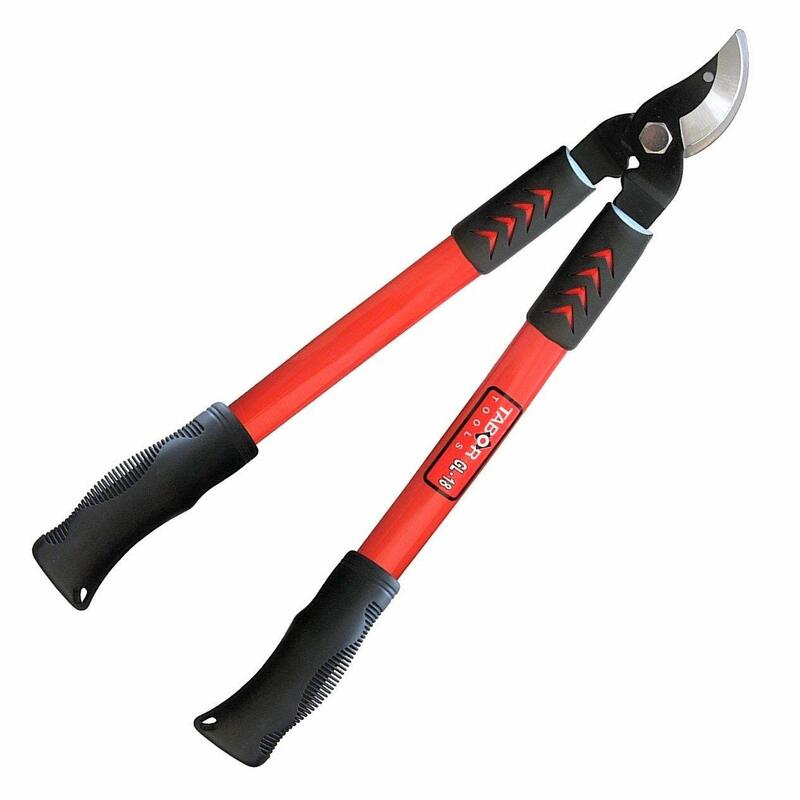 A little effort on the handles is quickly multiplied to superb cutting force at the jaws, quickly and effectively bringing down the toughest and thickest branches and limbs. The likelihood of it corroding, fading, tarnishing, rusting or wearing off are minimal at best considering the use of pro-grade Sk5 carbon steel for the construction of the upper blade. As well as boasting remarkable edge retention for long-lasting sharpness, the material similarly enhances its durability by effectively withstanding loads of wear and tear. It’ll take several years and some extreme abuse to put it down, especially considering that the blade features a long-lasting, rust-resistant PTFE coating. 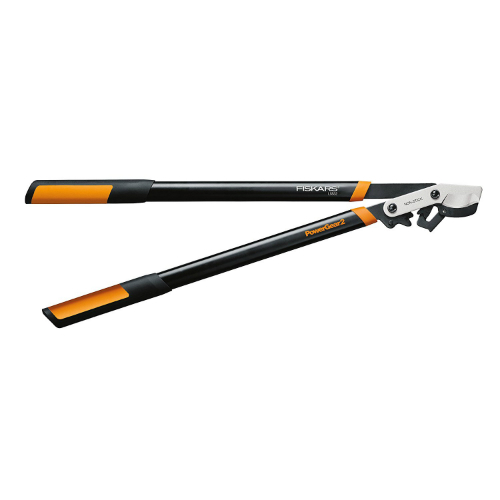 Users will also appreciate the product’s light but ultra-strong tubular telescopic aluminium handles that give quick and easy access to twigs, limbs, and branches in tight or awkward spots. The handles stretch between 18 and 31-1/2 inches. Handles come with a soft, rubberized grip that ensures a secure and non-slip grip. Together with the locking catch for safe storage, the 8290RS has virtually all the features a seasoned professional would need in a lopper. If you’re looking for an option that fits that description to a T, look no further than the Tabor Tools GL16. As well as being cost-effective, it is comfortable and highly functional, packing extra leverage for effortlessly cutting down the toughest branches around your property. And because it’s professionally balanced, it’s lightweight and compact and therefore an ideal candidate for otherwise energy-draining overhead pruning applications. Irrespective of use, the Tabor Tools GL16 will always remain sturdy and sharp for the next several years. The powerful performance is indeed a sight to behold. With a cutting capacity of 1-1/4 inches, it chops down thick branches, twigs, and limbs without the slightest hesitation. The bypass-design of its blade also accounts for how quickly and precisely it powers through various plants in the garden or yard, helping your plants grow to their full potential. The eye-popping performance of the bypass blades greatly endears it to the vast majority of value-conscious users. Their construction from fully-hardened carbon steel means they can stand up to heavy, extreme use and never lose their sharp, cutting edge. Besides, they sport the low-friction finish for which Tabor loppers are known, thereby providing for quick, trouble-free performance. Aside from its cutting power, it is also a snap to use. It's highly portable, thanks to its lightweight profile and professional balancing. To this add the fact that it has a 22-inch long handle with soft, rubberized grips for comfortable, continuous use. The handles also provide optimal grip and feature a shock-dampening bumper for minimizing hand fatigue and strain. The sheer length of the handles guarantees the user extra strength and leverage and makes it possible to maneuvre with ease around thick branches. We can’t recommend this option enough to the homeowner who needs optimal cutting performance. It’s durable, the blades stay sharp for long, and because of the low-friction, non-stick blade coating, they cut quickly, accurately, and easily. Another brand that pulls no punches to provide the user with an indelible cutting experience is Felco. It’s been in the industry for close to 65 years during which it has continuously pushed the boundaries on innovation and perfection. Felco (459067) 200 A, their leading option, is a perfect demonstration of the brand's unparalleled mastery of cutting-edge technology. Continuing a rich tradition of excellent craftsmanship, unsurpassed quality, and lasting durability, it securely and firmly grips on branches and twigs for quick and efficient cutting with the exceptionally sharp serrated blade. Besides being able to replace the tubes, it also features sturdy aluminium fibre tubes complete with comfortable handles. Perfectly balancing ease-of-use, user comfort, longevity, performance, affordability, and adjustability the way the Felco lopper does is not a mean feat. The blade is crafted from an industrial-grade material to enhance durability, resilience, and strength. 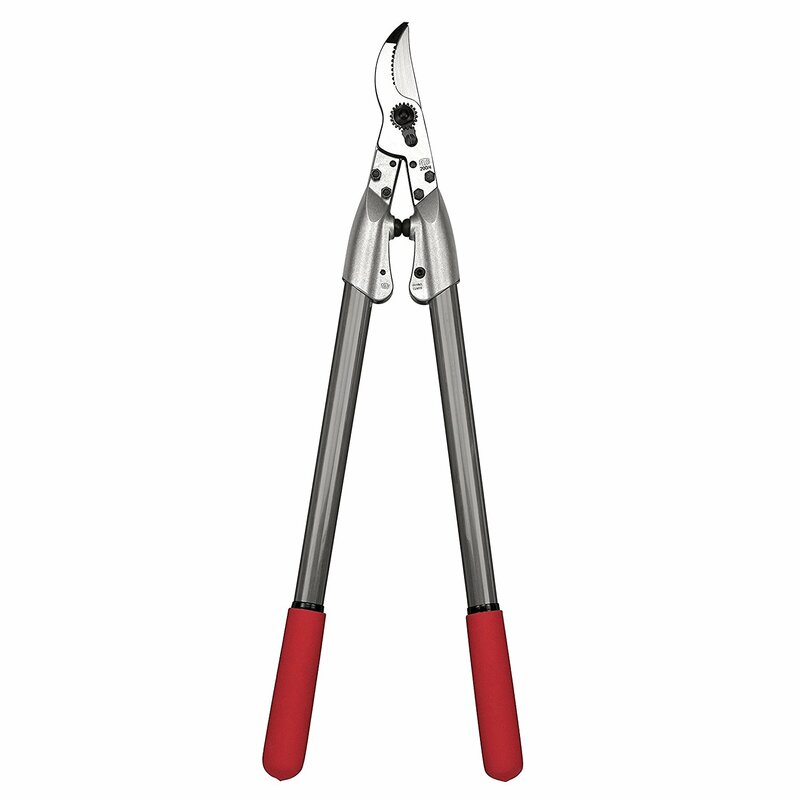 Consequently, with a cutting capacity of 1.4 inches, you can use them all day long to cut overgrowth. Featuring an innovative straight-cutting design, the head of the product allows you to cut precisely, smoothly and with minimal effort, making it an ideal choice for challenging and demanding work. To that add the fact that the anvil blade is slide-resistant. As well as the handles featuring an all-aluminium construction that won't twist or snap even with the excessive application of force, they also feature a shock absorbing system for minimizing the resultant impact and vibrations. As a result, you'll be using for hours on end without having to take a break to recuperate. They also come with a non-slip coating to ensure your grip is firm, secure, and comfortable at all times. If you’re looking for an option that meets most performance and convenience criteria, look no further than this option. It’s comfortable, durable, adjustable, easy to use, and easy to use. If your yard or garden is dotted with living growths like trees, chances are high you’re going to require an option that cuts branches and limbs smoothly and accurately without interfering with the green, living growth. 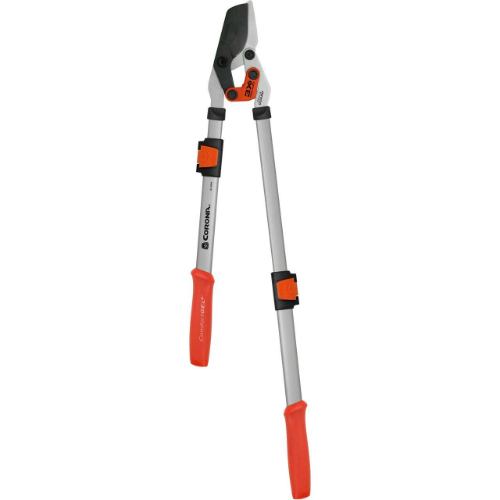 And one such product is the Fiskars 28 Inch option. It features a sturdy, rugged blade capable of maintaining a sharp edge through heavy use in light of its construction with premium, durable materials. The length is perfect for extra leverage and it boasts an impressive cutting capacity. The intuitive and ingenious design of the sharp, a durable option allows you to properly care for your garden trees and shrubs to encourage growth. The first outstanding feature is the impressive cutting capacity of up to 1-1/2 inches. Irrespective of how hard or tough the branch, limb, or twig is, the fully hardened, precision ground steel blade of the lopper will make short and quick work of it, provided, of course, that it’s up to 1-1/2 inches in thickness. The construction quality of the blade, particularly the use of high-end materials, means that it can withstand the rigors of any cutting task and never lose its sharp edge. The crowning stroke, though, is that the blade comes with a rust-resistant, low-friction coating to facilitate effortless gliding through the toughest branches and limbs and not gum up with sap and other debris. For painless and comfortable cutting of various branches and limbs, it thoughtfully incorporates shock-absorbing bumpers for eliminating any jarring at the end of a cut. The handles, on the other hand, sport non-slip comfortable grips to take the effort from gripping, carrying, and maneuvring them when you have to reach branches in tight and hard-to-reach spots. Plus, they are also capable of withstanding extreme use, thanks to their long-lasting, all steel construction. Heavy-duty cutting applications necessitate the use of a heavy-duty option, and we just can’t think of anything better than this durable, cost-effective, comfortable, smooth and easy cutting product. The MLTOOLS Easy Cut doesn’t come with any distinguishing features, which is not to say its performance can be lumped together with other options in its price range. Only a handful of loppers come with the time and energy-saving ratcheting mechanism, and one of them is this option. Consequently, it’s the all-time favorite among DIY enthusiasts, users with arthritis or those lacking in upper body strength but won’t entertain the idea of hiring a professional to do their garden for them. Aside from the ratcheting mechanism, it is also the poster child for durability, ease of use, and exceptional performance. The blade, for instance, features long-lasting and robust construction with the rugged, high-quality SK-5 high carbon steel, a material renowned for its sheer strength, resilience, and durability. They boast a cutting capacity of up to 1-3/4 inches. With proper use, maintenance, and care, it can easily outlast a lifetime of heavy use and simultaneously keep rust and corrosion at bay. Not a slouch when it comes to performance either, the MLTOOLS lopper packs all the features to enable you to complete your cutting projects efficiently, accurately, and in a snap. The first is the long-lasting edge retention that provides for clean, efficient cuts while minimizing the frequency of re-sharpening. Another is the telescopic handle that easily stretches to any position between 27 and 39-1/2 inches, thereby bringing twigs, branches, and limbs in hard-to-reach places within quick and easy reach. Since it is both lightweight and compact, you won’t experience hand fatigue or strain, which takes makes overhead cutting tasks easy and quick. The ratcheting mechanism, the highlight of this product, reduces cutting effort by up to 5 times compared to standard options. It also comes with light-weight and compact handles made from robust aluminium for durability. The handle feature non-slip grips for a secure and firm hold. With this Fiskars 32-Inch option, the brand continues to set the benchmark against which performance, durability, and ease-of-use should be measured. It incorporates several auxiliary features that work seamlessly and smoothly in tandem to provide the user with a mind-blowing performance. Like the first two Fiskars options we reviewed earlier, this model also incorporates the brand’s patented gear technology to make every cut quick and a cinch. Similarly, this option is easy to use, and offers remarkable durability, thanks to the hardy, fastidious construction that utilizes heavy-duty, long-lasting materials. It comes with a time- and effort-saving PowerGear technology that demands less muscle power and reduces joint strain. By multiplying your leverage, it reduces the effort you’ll be using by up to 3 times for every cut. As a consequence, cutting down thick and tough branches, limbs, and twigs will be both quick and effortless. You’ll be the envy of your neighbors still holding to their weak, humdrum traditional loppers. Boasting an impressive 2-inch cutting capacity, it also minimizes the likelihood of experiencing hand strain and fatigue as its both lightweight and compact. The smooth action of the unique gearing mechanism also substantially minimizes any jarring at the end of each cut as is often the case with traditional options. 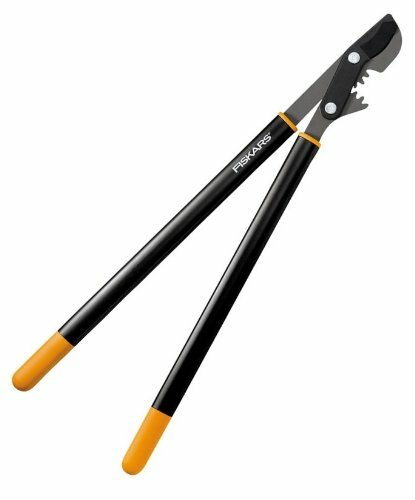 Thick and tough branches that you’d typically break a sweat while cutting through with a conventional option don’t present much of a challenge to the Fiskars product. In addition to the smooth action of the gearing mechanism, it also incorporates a heavy-duty, fully hardened, razor-sharp, precision-ground blade whose ingenious bypass design makes short and quick work of the thickest and toughest of branches and limbs. A useful corrosion-resistant, non-stick coating, on the other hand, minimizes friction for quick and easy cutting. Plus, the use of superior-grade materials for construction makes it lightweight, strong, and powerful enough to last more than a lifetime of heavy use. This option should be your first and only resort if you need an easy-working tool. It just never disappoints or knows when to give up. Tabor again proves its manufacturing prowess with this heavy-duty, high-quality Tabor Tools GL18 that cuts cleanly, accurately, and fast. While the 1-inch cutting capacity pales in comparison to the industry’s 2-inch average, it still quickly and easily chops down various thick and tough branches around the yard and garden. The bypass design of the blade, coupled with the fact that it’s fully hardened and forged from commercial-grade carbon steel means it’s one of the sharpest and sturdiest you’ll ever encounter. The attendant long-lasting edge retention and durability means this is a perfect choice for use on heavy-duty cutting applications. Coupled with the low-friction coating of the blade, it won’t be fazed by the most demanding or toughest applications. Another unique selling point is the unique design of the handles that accords the user the ultimate comfort when cutting branches and limbs. The handles feature soft, rubberized grips for a comfortable, safe, secure, and non-slip grip. Compared to other models in its price range, it has considerably short handles. At 20 inches, they don’t provide as much leverage as its competitors. What it lacks leverage it easily offsets with superior controllability, making it easy to maneuvre around tough branches and limbs in tight or awkward spots. Additionally, the tool is expertly balanced so it’s easy to use for overhead projects for hours on end with minimal exhaustion or hand fatigue. Another feature you’ll like about is the ease of storage. Compared to most of its competitors, this model has a smart storage option. By fitting the holes in the blades together, you form a perfect loop which you can then use to hang it to a hook or peg in between uses. And to top it all off, the tool comes with a generous warranty to cover you against deficiencies in material and craftsmanship. The Tabor Tools GL18 is a solid choice for the value-conscious user looking for great value for their money. It exceeds durability and performance expectations and will provide you with months, if not years, of flawless service. For the best results, go for options whose blades are forged from high-end materials. One of the most preferred materials is hardened high-carbon steel which, among other things, has a solid reputation for a longer shelf-life and a knack for withstanding loads of wear and tear and even extreme abuse. Similarly, the material should less susceptible to bending, cracking, rust, corrosion, and other corrosive agents. The highlight of blade quality though, it the ability to resist sap and other sticky materials or liquids typically encountered when cutting branches, limbs, and twigs. An added advantage, if you will, would be a low-friction coating to facilitate quick, effortless and accurate cutting. A second and equally paramount consideration is how flawlessly, quickly, and effortlessly you can use them to cut down a material. To this end you have a choice among geared, compound action, and ratcheting mechanism, each coming its fair share of upsides and downsides, of course. First off, geared loppers utilize gears to achieve extra leverage, thereby considerably reducing the effort you’ll require to make a cut. They increase the cutting efficiency by a factor of three compared to traditional options. Compound action features several moving parts and pivots that together guarantee 3 times the cutting power of conventional ones. 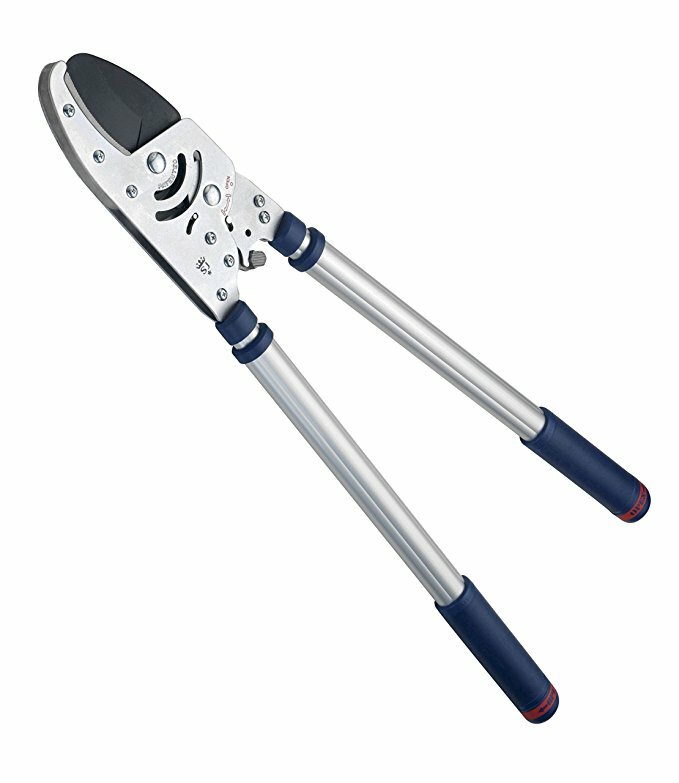 Ratcheting loppers, on the other hand, make squeezing and releasing the handles a cinch and like the geared cutting mechanism demands less effort from the user. Base your decision on the thickness of the branches you intend to cut. This refers to the ease of using them and it takes into consideration the weight and its grip . For prolonged use, you’re going to need an option with ergonomically designed handles that guarantee that your grip is not only comfortable also firm. Adjustable handles provide extra leverage and quick, easy access to branches and limbs in tight or hard-to-reach spots. Also, keep an eye on the weight and the profile. A lightweight and compact one with a shock-absorbing bumper stop will considerably minimize hand fatigue, strain, and blisters. As for weight, it should be reasonable enough for overhead cutting tasks which makes aluminum handles an attractive option. However tough your lopper is, its performance and efficiency will drastically reduce as it nears the tail end of its useful life. Replacing an old part here and there can, however, give it a new lease of life. As a result, ensure the model you’re enamored with allows for the replacement of aging parts as it’s a lot cheaper than replacing the whole unit. Q: What are the differences between options with an anvil style and those with a bypass style? A: Bypass ones feature two cutting blades that slide towards one another, unlike anvil loppers that come with a single blade attached to one of the handles while the other is fixed with a flat steel or nylon plate. While the anvil ones are more adept at cutting thicker branches, the produce rough, unsightly results compared to their bypass counterparts. Q: How do I maintain them? A: Care and maintenance are vital for optimal performance. Ensure the blade is sufficiently sharp before use. Also, clean it off debris, sap, and other sticky materials after use and store it in a clean, dry place to avoid rust and corrosion. Patently, none of our picks are the best loppers as that is predicated on the user’s unique requirements. Still, you won’t go wrong with any of them considering that they pack several nifty features to give you the best cutting performance and utmost convenience. They also seamlessly and expertly balance cutting power, construction quality, dependability, ease of use, and affordability. Keeping your garden or yard neat and stimulating the growth of your trees and shrubs is only a click away.